On 26 April the European Parliament held a debate on Hungary. In his opening remarks First Vice-President Frans Timmermans said that the Commission shares the worries and concerns of many people within and outside the EU regarding recent developments in Hungary, and about the compatibility of certain actions of the Hungarian authorities with EU law and with the shared European values. This was the reason, Timmermans explained that the College discussed the overall situation in Hungary first in its 12 April meeting, and again couple of hours before the parliamentary debate. At this latter meeting the College decided to start an Article 258 infringement action on the recent amendment to the Hungarian Higher Education Law, which aims at closing down the Central European University in Budapest. According to the Commission’s statement the law is not compatible with the fundamental internal market freedoms, notably the freedom to provide services and the freedom of establishment. But the Commission also invoked the right of academic freedom, the right to education and the freedom to conduct a business as provided by the Charter of Fundamental Rights of the European Union, as well as the Union’s legal obligations under international trade law. The Commission sent a Letter of Formal Notice to the Hungarian Government on this issue giving one month to respond to these legal concerns. As Timmermans reported, the draft legislation on the governmental oversight of the so-called ’foreign’ non-government organizations, a law that very much bear resemblance to President Putin’s ’foreign agent’ act is also on the Commission’s radar screen together with the new asylum law adopted at the end of March. Apparently, the Commission did not want to impose an infringement action regarding the asylum regulation, because there is already a pending procedure on the Hungarian asylum law. (In December 2015, after the Hungarian Parliament in July and September enacted a series of anti-European and anti-rule-of law immigration laws as a reaction to the refugee crisis, the European Parliament adopted a resolution calling on the European Commission to launch the Rule of Law Framework introduced in 2014. The Commission continued to use the usual method of infringement actions, finding the Hungarian legislation in some instances to be incompatible with EU law, specifically, the recast Asylum Procedures Directive and the Directive on the right to interpretation and translation in criminal proceedings. This was the first time that the Commission has alleged a violation of the Charter of Fundamental Rights in an infringement action.) In the current debate the First Vice-President also promised that the Commission continues to be attentive to the situation of the Roma in Hungary, especially to the discrimination against Roma children in education, which since May 2016 is also subject of a pending infringement procedure. In his speech Timmermans also announced the Commission’s response to the Hungarian Government’s ’Stop Brussels’ consultation, in order to correct false claims and allegations made in the consultation. Prime Minister Viktor Orbán in his speech on the one hand called the debate on the CEU ‘absurd’, based on falsehoods, on the other hand claimed that George Soros and ‘his NGOs’ are attacking Hungary and want to transport one million migrants to the EU per year. Many MEPs in the debate, including Manfred Weber, the president of the European People’s Party (EPP)-group, where also the Hungarian governing party, Fidesz belongs harshly criticized the Lex CEU, Guy Verhofstadt, the chairperson of the ALDE-group even asking Orbán, whether the next step will be burning books on the square in front of the Hungarian Parliament. Verhofstadt, together with the Frank Engel, MEP of the EPP-group from Luxembourg accused the Hungarian PM that he wants to continue taking the European Union’s money, but not the European values. 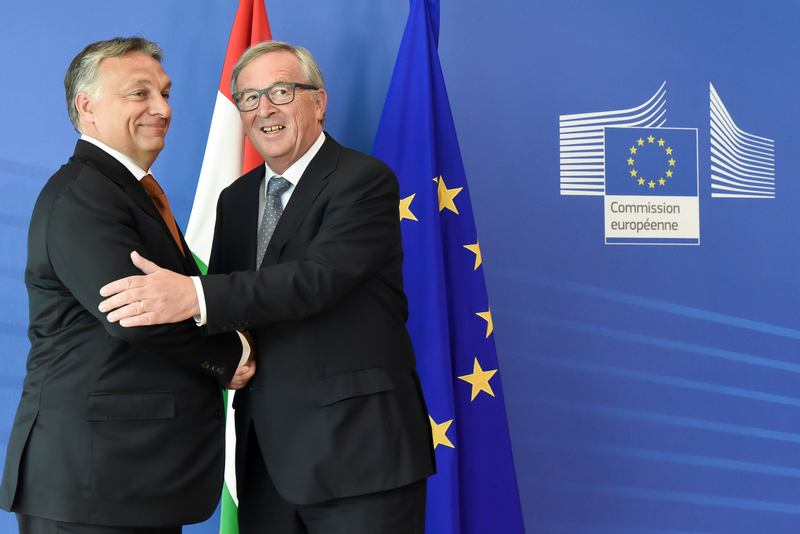 Therefore, for many critics of Hungary the obvious solution of the problem would be either a voluntary quit of the none-complying Member State from the EU altogether or its serious financial sanctioning by the EU. Orbán made it clear in his speech that he does not want to leave, rather to reform the EU according to his illiberal liking. Serious financial sanctions, like the substantial curtailment of the structural funds is only possible as consequence of an Article 7 procedure, which in 2015 after Hungary’s cruel dealing with the refugees was tabled by the ALDE-group, but finally rejected mostly because the EPP was not in favour. This means that the key issue regarding any EU move in the case of Hungary, whether the EPP is still protecting its member party, Fidesz. The recent parliamentary debate also has shown that there is a growing uneasiness within the group towards Orbán. The EPP’s statement also proves that the group is not ready to go for serious measures against the Hungarian government. But even if there would be a willingness to trigger Article 7, there is another obstacle, which became clear after the failed Rule of Law procedure against Poland. At that moment EU Commission President Jean-Claude Juncker told Belgian newspaper Le Soir that the so-called Article 7 procedure will lead to nothing “because some [EU] member states are already saying they will refuse to invoke it…This a priori refusal de facto invalidates Article 7 “. Juncker was referring to Hungary’s veto in the case of Poland, but the same can be expected vice versa. This was the reason for Kim Scheppele’s suggestion to start a joint Article 7 procedure against Poland and Hungary. According to Scheppele this would be the only chance to avoid the two illiberal Member States’ veto regarding the sanction against the other, because in her view a Member State, which is also warned under Article 7(1) cannot possibly veto the decision in the case of its ‘fellow-traveler’. The legal question, whether such an exclusion can be derived from Article 7 TEU or from Article 354 TFEU will only be answered, if the political decision on starting an Article 7 procedure would be made in the first place. Before triggering Article 7 the Commission could also have started a Rule of Law Framework procedure against Hungary. In June 2015, the European Parliament passed a resolution condemning Viktor Orbán’s statement on the reintroduction of the death penalty in Hungary and his anti-migration political campaign, and called on the Commission to launch the Rule of Law Framework procedure. But the Commission ultimately refused to launch the procedure with the argument that though the situation in Hungary raised concerns, there was no systemic threat to the rule of law, democracy and human rights. Finally the first step to use the Rule of Law Framework was taken by the European Commission against Poland in early January 2016. But the Framework proved to be useless in the Polish case, because after two recommendations by the Commission the Polish government refused to comply with any of them. Therefore, pre-Article 7 procedure does not seem to be promising in the case of Hungary either. With the infringement procedure regarding the CEU the Commission has chosen the easier legal approach, which is less promising to change the Hungarian government’s authoritarian attitude not only because – as we saw in the asylum and the Roma segregation case – it may not even reach the European Court of Justice, but also because as another Hungarian case in 2012 has shown, infringement actions are usually too narrow to address the structural problem which persistently non-compliant Member States pose. This happened when Hungary suddenly lowered the retirement age of judges and removed from office the most senior ten percent of the judiciary, including a lot of court presidents, and members of the Supreme Court. The European Commission brought an infringement action, claiming age discrimination. The European Court of Justice in Commission v. Hungary established the violation of EU law. But unfortunately, the decision was not able to reinstate the dismissed judges into their original position, and stop the Hungarian government from further seriously undermining the independence of the judiciary, and weakening other checks and balances with its constitutional reforms. Apparently, the ECJ wanted to stay away from Hungarian internal politics, merely enforcing the existing EU law rather than politically evaluating the constitutional framework of a Member State. This was the reason why Kim Scheppele suggested to reframe the ordinary infringement procedure to enforce the basic values of Article 2 through a systemic infringement action. As the infringement action in the case of CEU mentions the violation of three different provision of the Charter the Commission could have referred also either to Article 2 or for that matter to the sincere cooperation requirement in Article 4(3) and test the ECJ’s readiness to consider the systemic nature of the violations. But it is very unlikely that even a strong ECJ judgment could save CEU and the Hungarian NGOs, because by the time any decision is made it will be too late for them. In other words, the legal solution won’t ease the threat. But three days after the debate the possibility of a political solution has arisen, when the Hungarian Prime Minister was summoned to the Presidency of the EPP. According to the press-release “the EPP wants the CEU to remain open, deadlines suspended and dialogue with the US to begin”. (Just a reminder: the Lex CEU requests a new international treaty with the ‘American government’, never mind that the federal government has no jurisdiction for such negotiations.) EPP also stressed that “NGOs are an integral part of any healthy democracy, that they represent the civil society and that they must be respected”. Since “Prime Minister Orbán has reassured the EPP that Hungary will act accordingly”, the best case scenario for CEU and the NGOs is that the laws will be withdrawn. A more likely screenplay however is that Orbán will command the packed Constitutional Court to find some unconstitutionality in the laws, which will give a break for the attacked, while keeping the uncertainty of their status, and demonstrating to the critics of the illiberal state that rule of law is still working. See K.L. Scheppele, ‘EU can still block Hungary’s veto on Polish sanctions’, politico.eu, January 11, 2016. Hungary: no systemic threat to democary, says Commission, but concerns remain, Press Release, 2 December 2015. ECJ, 6 November 2012, Case C—286/12. For the detailed facts of the case and the assessment of the ECJ judgement see G. Halmai, ‘The Case of the Retirement Age of Hungarian Judges’, in F. Nicola and B. Davies (eds. ), EU Law Stories, Cambridge University Press, 2017. 471-488. See K. L. Scheppele, ‘Enforcing the Basic Principle of EU Law through Systemic Infringement Procedures’, in C. Closa and D. Kochenov (eds. ), Reinforcing Rule of Law Oversight in the European Union, Cambridge University Press, 2016. 105-132. European Elections and European Future: What to Conclude, What to Expect?